In almost every country, public procurements are the primary issue which citizens are the most sensitive to in terms of how public money is spent. Electronic procurement systems in the public sector have been adopted as a solution in order to respond to the sensitivity of citizens because of the benefits promised. In the early 2000s, Turkey both made the public procurement legislation approximate to the European Union standards and began to develop an e-procurement system within the scope of e-transformation Turkey project. As a result of the works carried out under the leadership of the Public Procurement Authority, which is an independent administrative authority, the e-procurement system started to be used in some stages of the procurement process. Four public hospitals were determined as pilot administrations in order to improve the implementation and it was aimed to make the implementation common in all sectors according to the experiences gained in this field. The objective of this chapter is to reveal benefits gained and barriers faced during the development process of the e-procurement by focusing on the above mentioned pilot implementation field. In order to attain this objective, the method of case study was adopted in this research, and guiding experiences were tried to be gained for the e-procurement implementations in the future. Electronic public procurement system is one of the milestones of e-Transformation Turkey which is defined as “a social transformation project towards becoming an information society” (State Planning Organization, 2004, p. i). When the system which is among 11 e-government projects prioritized by the Prime Ministry is completely implemented, it is expected to make great contributions to primarily public sector institutions, businesses and citizens (E-Government Advisory Group, 2008). E-procurement is estimated to provide an annual saving of 5 billion Turkish liras in Turkey where about 25000 public institutions make tenders of 70 billion Turkish liras annually and 100 thousand tenderers participate in these tenders (Gül, 2011). The task of developing the e-procurement project launched in order to gain such benefits as above stated or similar ones was assigned to the Public Procurement Authority (PPA) which is an independent administrative authority (State Planning Organization, 2005). Many countries in the world including Turkey have adopted developing an e-procurement system as a national policy. Moreover, the EU Ministers set such an ambitious goal as 100 percent e-procurement availability until 2010 in the Manchester Declaration of 2005 (Manchester Declaration, 2005). However, developing and adopting an e-procurement system connecting thousands of public institutions and businesses is a task which is complex and takes long time. E-procurement is not a simple, technical application which is based on the use of information and communication technologies (ICTs) instead of paper based systems (European Commission, 2010). 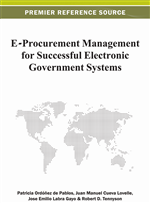 Successful implementation of an e-procurement system requires a fundamental transformation ranging from modernizing public procurement legislation to user-friendly, organizational reconstruction in public sector. The fact that every country has different organizational structures, procurement processes, habits, technological infrastructures makes the process more and more difficult. As a matter of fact, it is said that the reason why EU was very far away from realizing the objective set in 2005 was the technical, logistical and administrative complexity of the change (European Commission, 2010). In summary, there is not a standard e-procurement template fitting every country. That is why e-procurement system should be implemented gradually and finding out the problems faced during the implementation process is crucial.